Global Pet Foods – Hintonburg hosted a barking good fundraiser for us on the weekend. 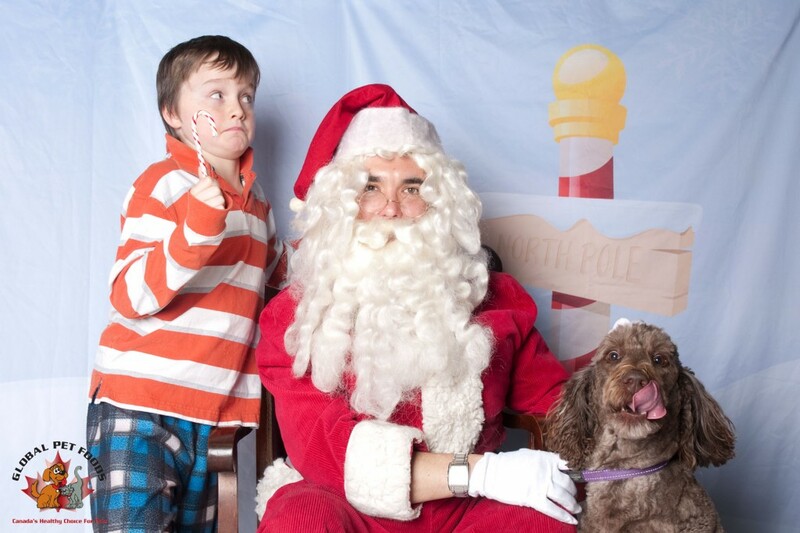 Santa was there and many adorable pooches, including this one, came by to tell Santa if they’d been naughty or nice. When Santa checked his list at the end of afternoon he saw two people in the “nice” category – Co-Owners Karla Briones and Shawn Hoey who topped up the proceeds to PFC to $250! We love our Community Partners who keep finding creative ways to raise money for us. West Wellington Holiday Shop Hop- Where Generosity is Always in Fashion! 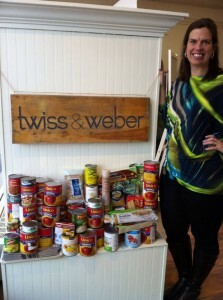 Natalie Robichaud of twiss & weber with customer donations destined for the Parkdale Food Centre. The spirit of the season was alive and well on December 5 as more than 25 of Wellington West’s most popular shops hosted their annual Holiday Shop Hop! Offering special gifts and discounts in exchange for donations to the Parkdale Food Centre, our community partners on West Wellington opened their doors and their hearts to our neighbours in need. Huge thanks to all of our community partners and individual donors for helping to spread the spirit of giving. Fashions may come and go but generosity is always in style! 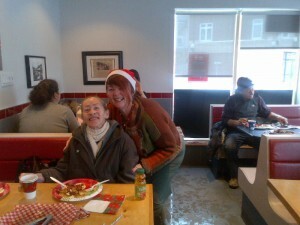 Hintonburger has shown tremendous generosity this holiday season for the PFC. They are hosting three client breakfasts throughout the month, opening early for our clients and making them feel special. Our clients are happy to get such a wonderful way to start their days full of pancakes, bacon and other treats. Hintonburger is also generously donating 10% of all sales on Mondays for the whole month of December. As in the past during our BBQ in June, Hintonburger owners show they are a true ongoing Community Partner for us. We are grateful for their support and absolutely delicious food! 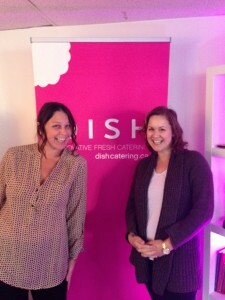 DISH Catering turns a challenging situation into a win for PFC! When a client had to cancel a large event on the day of, Erin Clatney, owner of DISH decided to use her creativity. She sent a message out to her friends and customers and asked them to pop by and enjoy some of the amazing food and make a donation to the Parkdale Food Centre. Many folks popped in and one of her talented chefs even decided to donate his wages for the evening. As a result Dish Catering was able to raise $833 for us! This is a wonderful example of what a great community partner Dish Catering is. 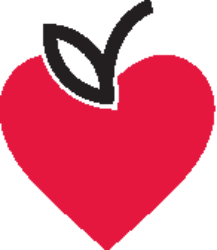 We want to extend our thanks to some of the great members of our community that have been so generous to the Parkdale Food Centre lately, including our new friends at terra20, and the Kitchissippi United Church Women. Thanks to everyone who nominated us for terra20’s “favourite community initiative.” We were honoured to be recognized and to receive 10% of the terra20 preview evening proceeds. Sales were brisk on the opening night and we received $1000 from the terra20 team. Amazing! These funds will help to address our budget shortfall so that we can continue to provide our neighbours in need with wholesome food and other programs aimed at building healthier, more connected communities. 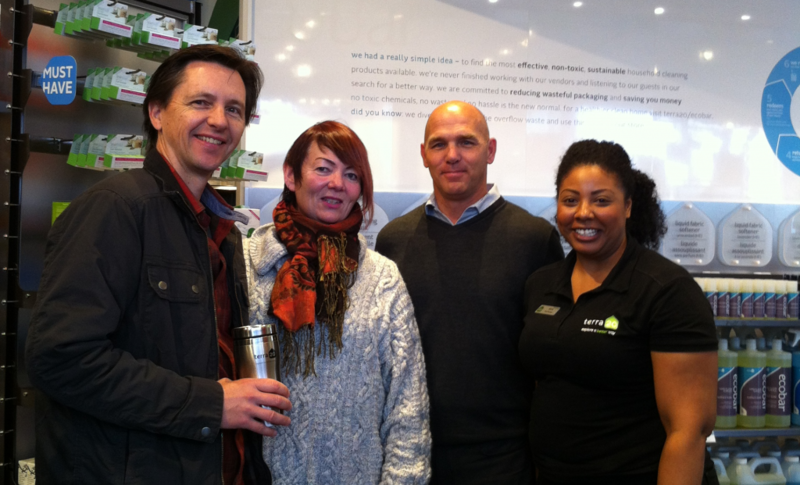 The PFC's Karen Secord with terra20's Assistant Store Manager Julia Rennals, Co-Founder and CEO Steve Kaminiski, and Co-Founder and President, Bill Stewart. If you haven’t already visited terra20’s new store at 1304 Wellington St. W., drop by and say “thanks” to the team for lending a hand! Special thanks are also needed for the Kitchissippi United Church Women (UCW) who raised over $3300 at their annual fall rummage sale. The UCW will be donating 50% of the proceeds, or over $1600, to the Parkdale Food Centre in support of our Christmas and Good Food Box Family sponsorships. We are incredibly grateful to the ladies at the UCW for their friendship, support and commitment to making our community a more loving, supportive and welcoming home for individuals and families in need.